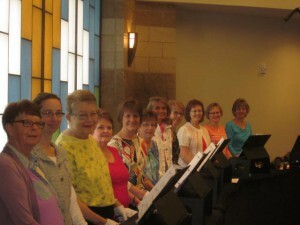 The handbell choir rehearses on Tuesdays evenings at 5:30 from September through May. We ring at the worship services one weekend each month. Our music ranges from traditional to contemporary music. 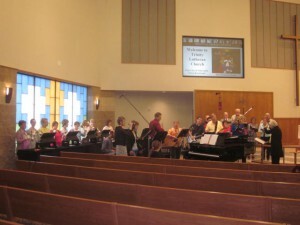 Occasionally we are joined by piano, adult choir, or praise team for special music. If you are interested in joining the handbell choir, please leave a message for Jean Barkley or Linda Stevens at the church office (665-7415). 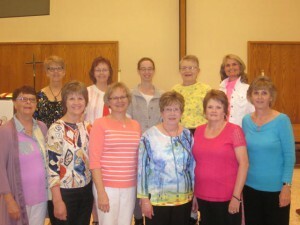 Back Row: Lois, Kris, Lilah, Joanne, Linda S.
Front Row: Linda L., Robin, Julie, Susan, Bev, Jean. Choirs joining together for "Mighty to Save".